Our Bar Necklace in Gold Plated with Semi-Precious Gemstone offers lots of gorgeous details. The look begins with the incomparable glow of gold and continues with the addition of a semi-precious gemstone. 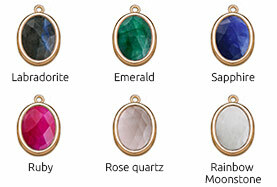 There are six distinct gems to choose from, each with a unique color all its own. Choose emerald if you love the look of green, or opt for rose quartz if soft, feminine pink is your favorite. The rainbow moonstone offers a subtly iridescent white hue, while the labradorite brings plenty of contrast with its deep, rich black color. Semi-precious ruby lends a dark pink tone, and sapphire stuns with exquisite deep blue. The vertical bar pendant may be customized with your choice of an initial, name, or word. The necklace is made with 18k Gold Plated 0.925 Sterling Silver. The pendants are suspended side by side from our New Beaded Chain, which is also made of Gold Plated Sterling Silver. Be sure to view our bar pendant necklace collection for additional options, including this stunning style in your choice of Sterling Silver or 18k Rose Gold Plated.